(TibetanReview.net, Nov06, 2014) – Tibetan middle school students, joined by local residents, have staged a demonstration Nov 1 in Dzoege (Chinese: Ruo’ergai) County of Ngaba (Aba) Prefecture, Sichuan Province, protesting against plans to replace Tibetan with Chinese as the language of education in the nomadic schools in the prefecture. 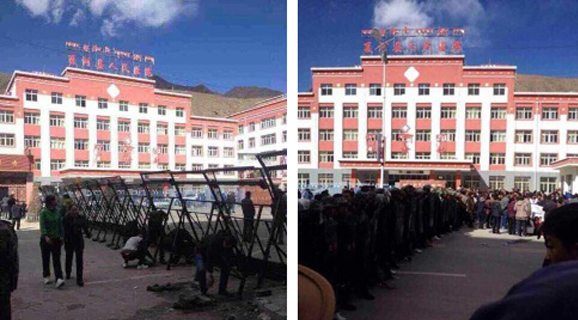 The protest followed a workshop on Oct 29 called by the Ngaba Education Board and in which more than 130 students from Tibetan schools in the prefecture’s Barkham (Ma’erkang), Chuchen (Jinchuan), Zungchu (Songpan), Ngaba (Aba), Dzoege, Khyungchu (Hongyuan) and Dzamthang (Rangtang) counties took part, according to the exile Tibetan administration at Dharamshala, India, in a statement posted on its Tibet.net website Nov 5. Washington-based International Campaign for Tibet (ICT) said Nov 4 that the protest was apparently sparked by an official meeting on nationality and bilingual education in the prefecture held on Oct 29. It said the protesters raised slogans demanding equality of education. This report said the protesters were students of Dzoege county middle school. It added that details about the discussion were posted on a county government website. Bilingual education simply means Tibetan being taught only as a language subject with all the other subjects being taught in Chinese.